We recently visited an exhibition dedicated to the 1909 Regional Expo’s centenary at the Ateneo Mercantil in the Plaza del Ayuntamiento (location) and found ourselves more fascinated by the building than the exhibition itself. 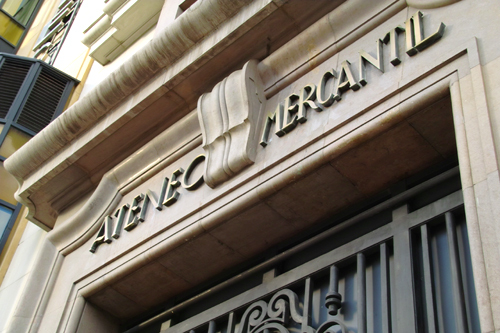 The Ateneo Mercantil was founded in 1879, to “attend to the cultural and educational needs of the employees of the commerce sector”, and it’s been a stable presence in Valencia for over 125 years. It helped to organize the Regional Expo in 1909 and was awarded a golden medal by the city in 1960. Today, the Ateneo Mercantil boasts over 3000 members. Though such boldness might be frowned upon in its somber halls, Juergen and I left the public exhibition and thoroughly explored each of the Ateneo’s seven floors. Members have a lot with which to entertain themselves — a library, TV room, theater, billiard hall, restaurant, an internet station, newspaper library and more. And of course, the building sits atop one of the prime locations in Valencia, on the Plaza del Ayuntamiento. 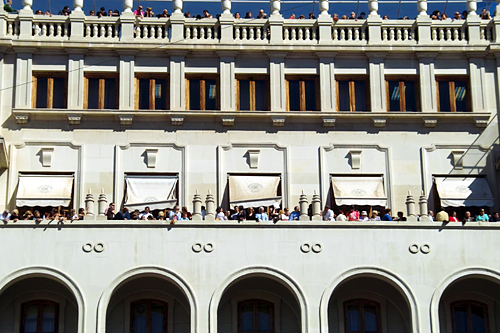 It’d be tough to beat the view from the Ateneo’s balconies for the mascletàs of Fallas. Walking around, one is given the impression of an old boy’s club — the members are probably loaded with both money and connections. Though joining isn’t all that expensive (inscription fee of €500 and monthly dues of €16), you do have to be recommended by two current members, which probably precludes poorly dressed foreigners like us.